Receive a $35 discount if you previously purchased an ICTG guide. Only $60 for 6 sessions! 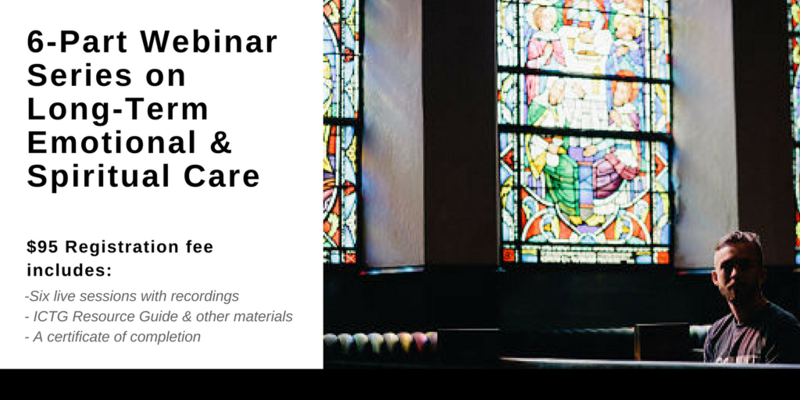 In light of the recent catastrophes across the United States, including hurricanes, flooding, wildfires, and shootings, ICTG has put together a six-part webinar series on Long-Term Emotional and Spiritual Care. In this webinar series, you'll learn how to discern your role and responsibilities as a caretaker, how to network well with colleagues in your “Village of Care”, how to assess long-term effects among your community, and how to strategize effective care. All sessions are recorded and available to listen to on-demand at your convenience. Each sessions runs about 30 minutes - 1 hour long. In addition to access to all six recorded sessions, the registration fee also includes access to one ICTG Resource Guide of your choosing (General Ministry, Youth Ministry, or Spiritual Direction) and a certificate upon completion of a final quiz. If you've previously purchased a guide, you may use that along with the sessions, and receive a $35 discount!